If you’d told me two years ago when I designed the Miracle Shape top, that I would have built up a following of clients, who would respond the way you all respond, whenever I make a new collection of these tops, I don’t think I would have believed it. It is a dream come true, to know that every time I go fabric shopping, and I put this incredibly rewarding shape into production, you all respond exactly as I dreamt it, with such gratitude. Pink Paisley miracle shape top. It is such a privilege to be doing what I’m doing…every.single.day. In store now in a variety of prints. 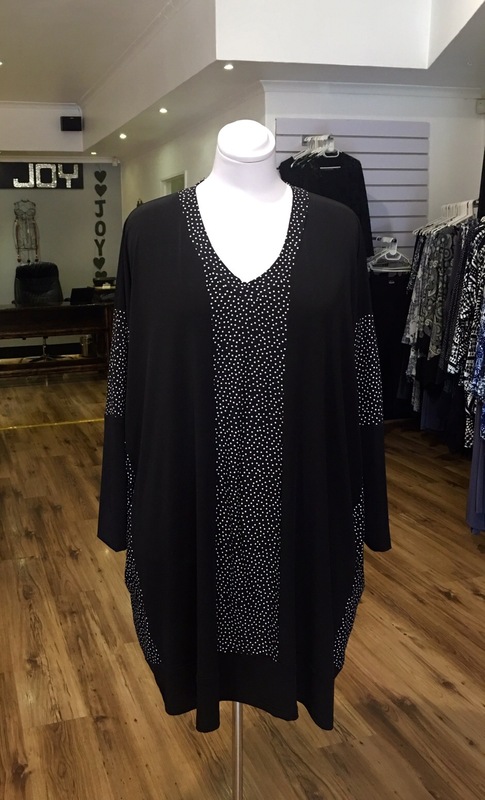 The simplicity of the Hayley Joy Miracle Shape top. Black and White Spot, Miracle Shape top. How do I explain to you via a social media post, how incredible the fit of this very simple Plus size, Miracle Shape top is? The best I can do is post this photo, and tell you that after all these years, I still marvel at how the simplest of fabrics and designs still have the ability to blow me away. When I first tried it on, my instant reaction was…wow look at how much shape I have, even after a ‘bit of a fall off the weight bus, winter’…eeeek!! The fabric is definitely the reason for the wonderful fit. It is lightweight and has a slinky feel to it, but it doesn’t cling. I’ve kept the design very simple and am letting the fabric shine this time. If you’re looking for a simple, casual, comfortable top for everyday, this is it. For those of you who have already bought it, thank you for the feedback and I’m glad you are enjoying the simplicity and comfort. Illusions created by Diagonals for Plus Sizes. Pink and Grey Animal print Overvest with black Undertop. In my never ending attempts to create slimming illusions, I have come to really appreciate the power of diagonal lines. With each new design I get to see how much slimmer I can make you look, by combining complimentary fabrics, and playing with interesting and flattering angles. This fabric posed a challenge, as it actually has distinct horizontal lines that are set widely apart, which is not flattering for Plus sizes at all. Hayley Joy production and I pushed the boundary somewhat, and cut the panels in such a way, that you don’t notice the stripes. I soooooo love that we can do that!! It’s one of the many advantages of me having my own production facility, we can play around with concepts that would never be entertained by a CMT factory, and if they did, it would be way to expensive. It doesn’t always make good business sense because it takes that much longer to hand cut, but I really loved the fabric and knew we could make a plan. This multi fabric mesh overvest is in store now, and works perfectly paired with a plain black short sleeve Miracle undertop. Price R899 for the Overvest, R599 for the Undertop. 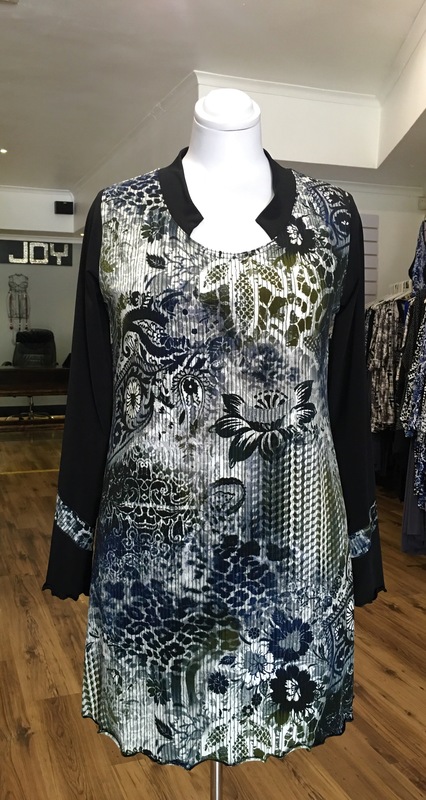 The exclusive Hayley Joy Miracle top shape, that brings me immense Joy. Every Plus size Miracle top that I design revolves around the fabric. As you know by now, I love everything fabric related, designing it, designing with it, and of course buying it. I have been very fortunate to be able to work with a team overseas who indulge my vision on every level. I have been just as fortunate locally, to be able to be part of the selection process of specific prints, that are in line with the HJ handwriting. My sole purpose when I designed the basic Miracle shape, was to provide consistency. Being a Plus size myself enables me to understand the trauma behind anything Plus size clothing related. I wanted to develop an exclusive Hayley Joy, Plus size shape, that would flatter all shapes and sizes, from a small to a 7XL, and that would fit the same, ALWAYS! I was determined to show respect for all sizes, and the only way I knew this would be possible, was if I created a shape that was consistent. I have been using the Miracle shape for two years now, and it has proven to be the single most inspired design I have produced in my 30 years of clothing design. I get to experience the joy this shape brings, on a daily basis in the store. HJ production and I are aware that not every fabric will offer the same fit, but by working with reputable fabric suppliers, we have been able to offer this shape with consistency. I am loving how clients from all over the world are ordering this Miracle shape with confidence. I am able to advise around the fit, according to the quality of the fabric (stretch, hang etc) and our success rate makes me a very happy designer. These three tops are the first with the new 1/2 collar detail I’ve designed. There are a fair amount of clients who ask for collars, and it’s not something I really offer, as collars are just not my thing, but this collar is a design aspect that fits in perfectly with the fabric, style and season. 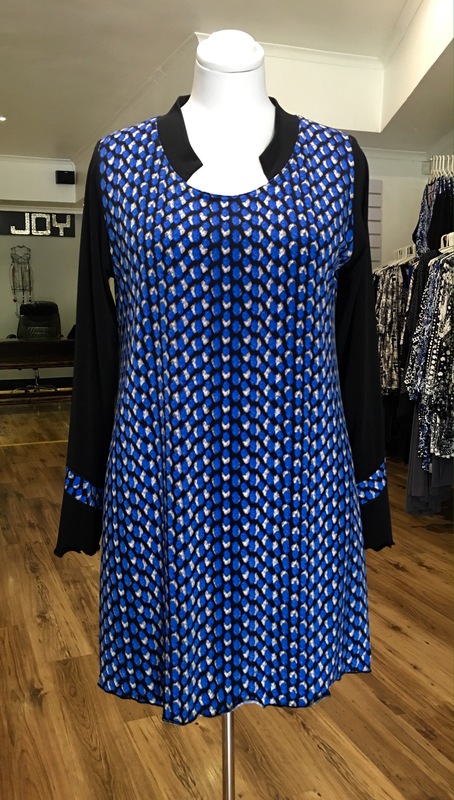 1/2 collar Miracle tops are in store now, sized from M – 7XL. Apologies for the lack of blogging. This month has been a crazy busy one in production. My fabulous production team have been sewing up a Miracle top storm, in anticipation of a crazy December. I love this time of the year, you’re all planning to go on holiday, and I’m planning your wardrobes. We have made a new version of the Miracle Pan top, so many of you have asked for it, so I tweaked it a little and exactly what sold me on this top last year, is exactly what’s sold me this year, those side panels create the best illusion. Oil slick print for Pan tops. HJ production has been very busy producing a new collection of Miracle tops. I have never loved selling a top, more than I love selling the Miracle top, it allows me to transform all different shapes and sizes, and that was always my ultimate dream. The two tops below are both designed on the Miracle shape, and there really isn’t much more to say, other than I’ve tried them both on, and they are soooooo flattering. 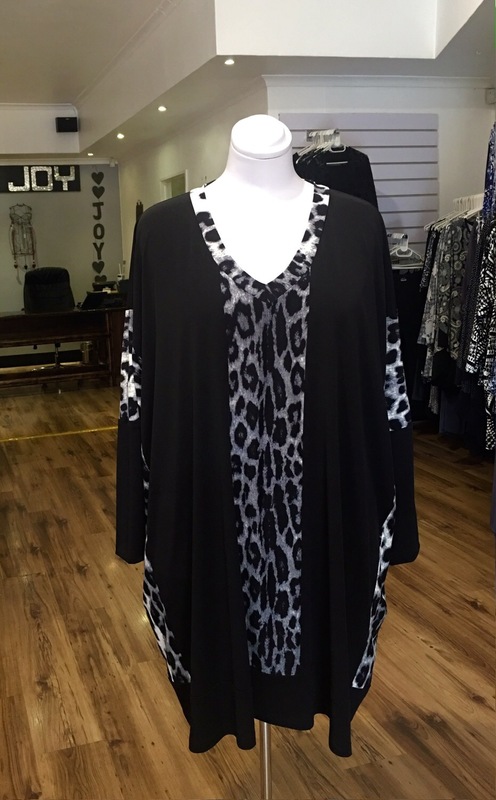 The feel of the brown animal print fabric against the skin, is gorgeous, it is silky and yet still has body. It’s a weird combination, but I’ve loved working with it, because it translates perfectly into a Plus-size style.